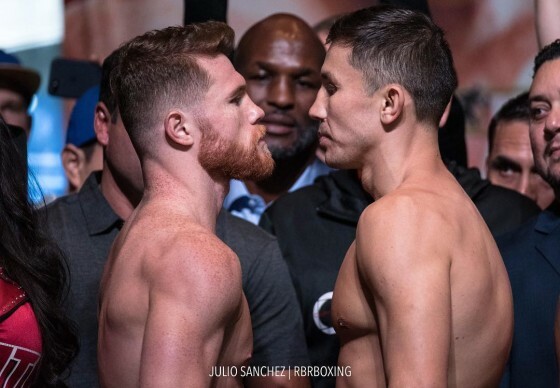 Moments ago, inside of the MGM Grand Garden Arena in Las Vegas, Nev., IBF/WBA/WBC middleweight champion Gennady Golovkin (37-0, 33 KO’s) and his opponent, two-division world champion Saul “Canelo” Alvarez (48-1-1, 34 KO’s), both weighed in at the middleweight limit of 160 pounds ahead of their showdown tomorrow night. Golovkin and Alvarez meet on HBO pay-per-view from the T-Mobile Arena in a fight that serves as the most significant and intriguing fight to make in the sport of boxing. Check below for a closer look at Friday’s weigh-in.